Though always creative, Shari didn't begin painting until later in life, after serving 8 years active duty in the Air Force, and after raising her family. Once her children moved out on their own, she decided it was time to take her art seriously. By investing in a few years of private instruction and by taking a drawing course, she was able to progress quickly. Those years of instruction were rigorous, learning about art history, drawing, and painting techniques. One of the most important lessons was learning to paint from direct observation, a method that Shari employs to this day. For times when she is not able to paint from life, she relies on her own photos, focusing on compositional elements, interesting shadow patterns, dramatic lighting, moody skies or people, fully engrossed in something. Her objective when creating a work is to focus on translating a feeling, mood or story. 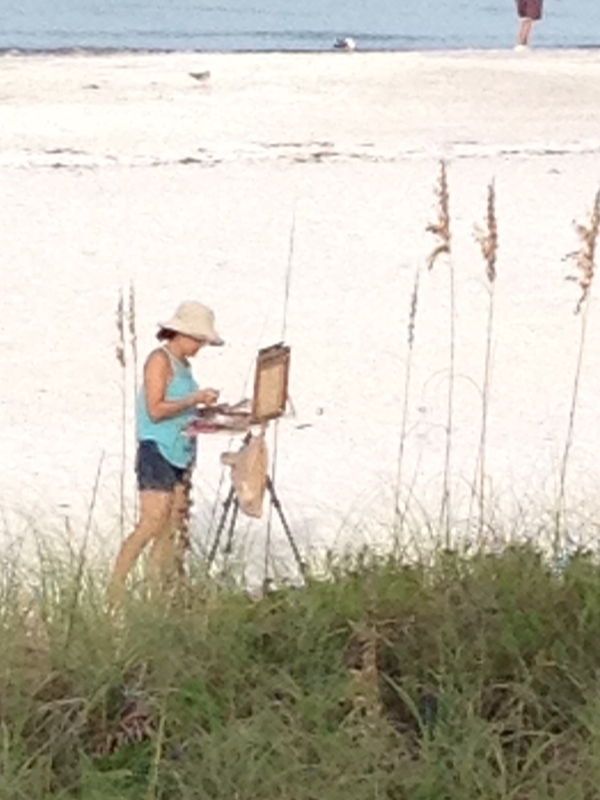 She is particularly enamored with painting outdoors, en plein air. 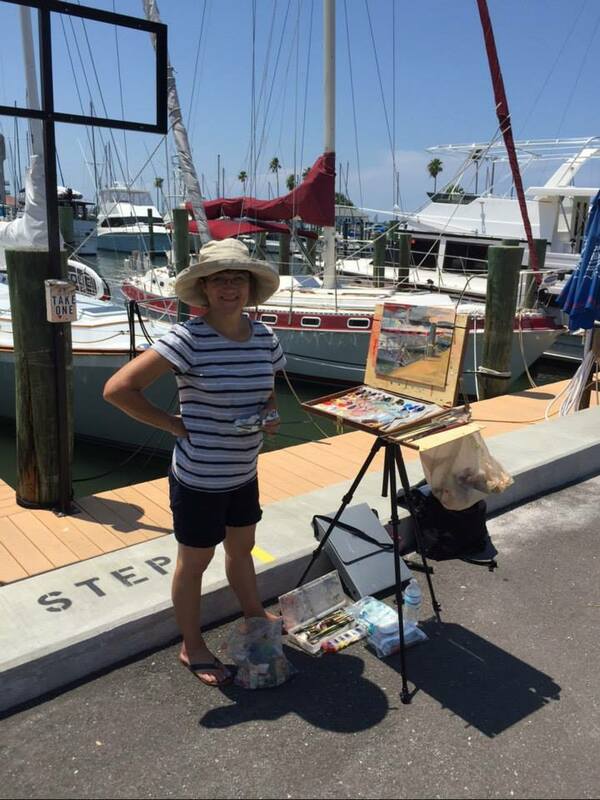 She doesn't shy away from painting in public and is often spotted on the local beaches, marinas or in quaint downtown areas with easel, oil paints and brushes at the ready. 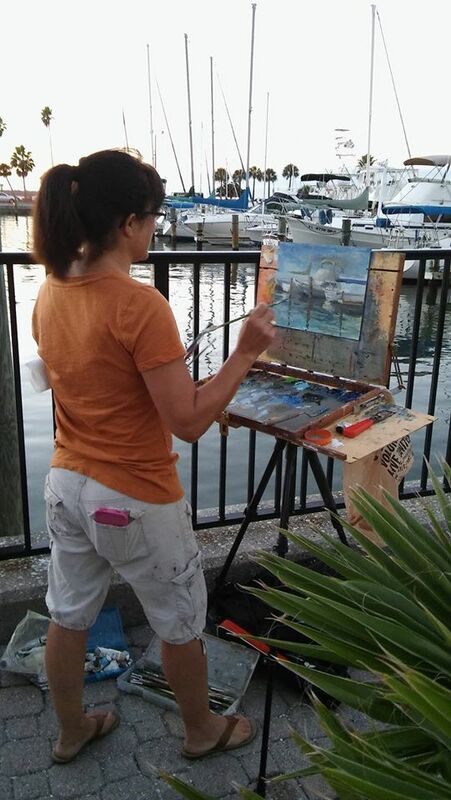 "It took me a while to feel comfortable painting in public but now I can't get enough. I feel like a street performer at times but that is all part of the experience". She paints, chats and tells stories and listens to the stories that others love to share with her." All of my senses become fully engaged. Even the smells and sounds play a role in the creation of a work done on location." Her passion comes through in her work. "I've been told that my paintings have an authentic feel to them; a real sense of place." 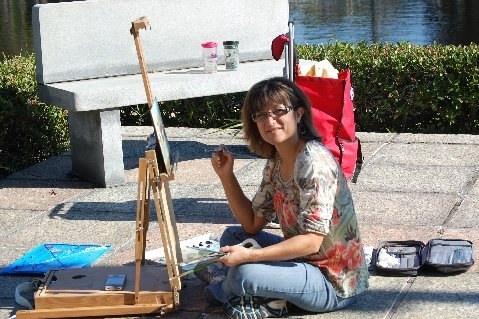 Shari also enjoys painting portraits or figures from live models. "There is something quite magical about a one-on-one 2 hour session with the model. I feel a deep bond with my subject on a level I can't put into words." "Poetic Sea" was part of the February 2019 Fav15 (Favorite 15% by FASO and Fine Art Views Staff Members) Bold Brush Competition. "Near and Far" and "Neptune's Hopscotch" were part of the October 2018 Fav15 (Favorite 15% by FASO and Fine Art Views Staff Members) Bold Brush Competition. "Rita's Dream" was awarded 1st Place in the second annual Beatles Era Art Festival 2018 at the Stirling Gallery. "Sorting Sponges" was awarded Honorable Mention in the Stirling Gallery, "Florida Impressions 2018" show. "Seated Male" was awarded Third Place in the May 2016 Society of All Artists (S.A.A) Life Drawing challenge. "Buds and Blooms" received a Special Recognition award in the April 2016 Botanicals division of Light, Space and Time. "Path to the Tasting Room" received a certificate of artistic excellence "Highly Commended" award from the Society of All Artists (S.A.A.) in the April 2016 Light and Shadow challenge. -"Roxburgh Fig" received a 2nd Place in the professional division of the Florida Botanical Gardens "Diggin' The Arts 2015" Quick Draw challenge. "My passion for creating pushes me forward. I am an explorer and a conqueror! My journey has no end."